The first stars in the universe may one day be detectable by the unique way they likely spread across space, researchers say. 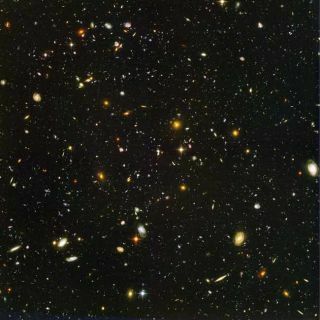 The cosmos was born in the Big Bang about 13.7 billion years ago, and the first stars in the universe are thought to have lit up about 100 million years afterward,when gas finally gathered in clumps dense enough to collapse under their own gravity and ignite nuclear fusion. However, it remains very difficult to determine when exactly these stars were born or much else about them, since their faraway light is largely obscured by closer sources. Now the circumstances under which these stars formed could lead to patterns in how they are spread throughout space that astronomers could soon detect. The first stars formed when clouds of gas bunched together due not only to the pull of their own gravity, but also that ofdark matter. This invisible substance apparently makes up five-sixths of the universe's matter, and its gravitational attraction is what's thought to hold galaxies together. Normal matter at times moved too fast for dark matter to capture with its gravity, much as rockets flying at escape velocity can pull away from Earth. This would have led to less clustering of matter, and fewer birthplaces of stars than once thought, study author Rennan Barkana, an astrophysicist at Tel Aviv University in Israel, told SPACE.com. Based on these differences in speed between normal and dark matter, as well as how radiation from the earliest stars would have influenced stars forming soon after them, the researchers calculated where the first stars would have appeared in the first 180 million years of the universe on the largest cosmic time scales. They found a distinct pattern in the distribution of these stars, which upcoming telescopes such as the Murchison Widefield Array in Australia — a radio observatory under construction now — could detect. "This signal is larger than before thought," Barkana said. However, current radio telescopes are not sharp enough to image any specific examples of these first stars; they can see them only en masse. Still, by looking at them all together, "we can get statistics on them, average out all their information and learn about them that way," Barkana said. The scientists detailed their findings online June 20 in the journal Nature.